Today marks my last full day in Europe after living here since August. It also marks the end of my 19-day journey through France, Belgium, the Netherlands, Luxembourg, Germany, Czech Republic, Austria, Denmark, Sweden and Norway. It was fully worth the two jobs I worked this summer. It’s hard to believe that I have been touring here for almost 19 days now. It has been an unbelievable journey through 10 very unique countries that I will remember for the rest of my life. I am glad overall that I was able to journey with Uncle Barry and by myself. The last 11 days have really tested my independence, ability to survive and function in several different countries, and tested my values. It has been a great adventure and I have learned a lot about myself and other cultures. However, I miss London and the U.S. so I think I am ready to return to South Kensington. My brother is coming in a little over two weeks and I am very excited for him because I know he will have a blast. I used today to finally tour Oslo. I woke up at 8 a.m. and packed my things up one final time. Wow, what a mess it was! I then showered for the first time in a couple of days (I’m embarrassed to admit that) and grabbed one last tasty Scandinavian breakfast. Afterwards, I finished packing my gear and headed back towards Oslo Centrum Stasjon. There I put my gear in a locker and went out for a tour of Oslo by foot. I headed down Karl Johans Gate, Oslo’s main street, named after King Charles III John, who was also King of Sweden. The street connects Oslo Central Station to the Royal Palace at the end. I then headed down to Oslo Domkirke, Oslo Cathedral. This domed church dates back to 1694 and was constructed of the Scandinavian style with a beautiful tapered ceiling, lantern lights and two beautiful organs. It is the main church for the Church of Norway Diocese of Oslo. 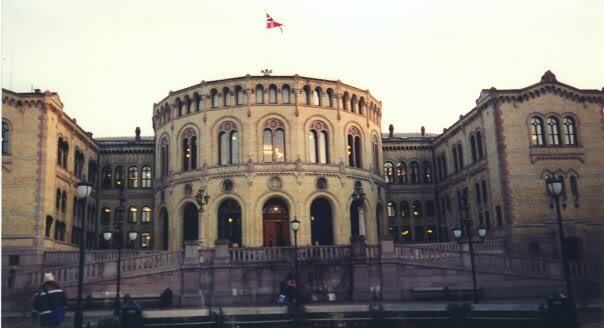 I also passed by the Stortinget, “the Great Council,” which is the supreme legislature of Norway that was established in 1814 by the Constitution of Norway. I then walked down the snow-plowed street, stopping at various souvenir shops before arriving at the Royal Palace. I couldn’t believe all the Norwegian flags decorating every block of the street. It seems Norwegians, like Americans, are very patriotic and proud of their country. The Royal Palace was built in the first half of the 19th century as the Norwegian residence of King Charles III, who also reigned as king of Sweden. Today the 173-room palace is the official residence of the Norwegian monarch. The palace was beautiful, but admittance isn’t possible in the winter time. The views were worth the walk, however. I then walked past the National Theatre down to the Akershus Slott, or Akershus Castle. 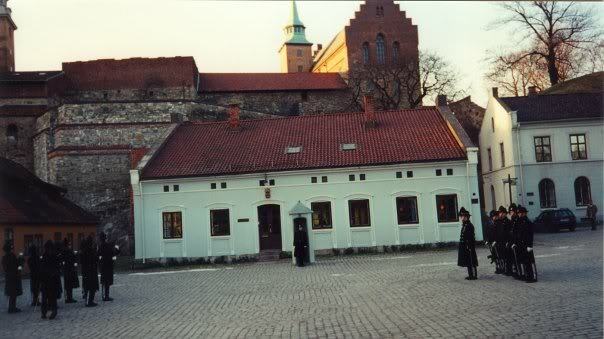 The medieval castle dates back to the 1290s and was built by King Haakon V to protect Oslo. There I took in great views of Oslo fjord and entered the Norwegian Resistance Museum. Most interesting were the exhibits on the courageous Norwegian parachutists who destroyed the Nazi heavy water plant in Norway with explosives, thus eliminating any of Hitler’s hopes of developing atomic weapons. Also at the fortress is a joint modern headquarters that belongs to the Norwegian Ministry of Defence. In the castle is the Royal Mausoleum containing the remains of generations of Norwegian Royalty. Outside I saw the changing of the guard on my way out and I walked to a souvenir shop where I purchased souvenirs for Dad, Mom, Jeff and Granny. I walked by the Oslo Rådhus which houses the city council, city administration and art galleries. The Nobel Peace Prize will be presented in two days by the King here, which is always on December 10. I then headed back to Oslo Centrum Stasjon. I stopped for a late lunch at Burger King before going to the station. I pulled my gear out of the locker and took the 15:30 p.m. Oslo Airport Express Train (ticket cost about $10) to the airport about 80 kilometers away. The express train was sleek and zoomed me to Oslo airport in about 25 minutes. At Oslo International Airport, I checked my gear in and received my ticket to London from my travel ticket that I bought at London’s Council Travel. The flight on British Midlands Airlines was a low-cost carrier being offered in Oslo in conjunction with SAS (Scandinavian Airlines). After visiting the restroom and the duty-free shop, I wrote journal entries while awaiting my flight. I was very impressed by Oslo’s new airport and Oslo in general. It’s probably the prettiest country I have ever visited and has some of the friendliest people. My flight boarded at 17:45 p.m. and left at 18:00 p.m. for Heathrow. This would be the first time I would ever fly into Heathrow because normally I flew into Gatwick. I had a good ham pasta meal, a Coke and some peach ice cream. Then I arrived at Heathrow at approximately 19:35 p.m. GMT. I was very happy with the flight and glad to be back in London! Upon arrival, I picked up my gear and caught the Piccadilly line to South Kensington. I arrived back at Gloucester Road at about 20:30. It was good to be back at my home for the last four months, where I dropped off my gear. To my surprise there were about 20 people residing there, not including approximately five students and one of my professors. I spoke with friends Rachel and Cal before going out to get my final supper: a take-away £3 pepperoni pizza and a hot chocolate from my favorite restaurant, Caffe Forum. For this part of London, it’s a bargain. The £3 deal is half off the normal price of £6 if you arrive before 19:00 p.m. I have talked to many locals who say it’s the best pizza in London and the place is really a hole-in-the-wall cafe. Then I came back to our residence and watched part of the movie “Swinging Doors” with Cal as I ate my supper. I then corrected my internship paper with that I would turn in to my professor upon my return to the U.S. Afterwards I packed my final things before going up to a room I would share with Cal, Rick and Chad. We had a few Kronenborgs out on the fire ladder in the London drizzle until about 2 a.m. We then went to bed for the final time in the U.K. It was a little bit of a sad evening, but things seemed different than before. I was sleeping in a different room on a different floor. Many of our fellow friends had already left, there were older alumni staying at the Centre and I was somewhat culture shocked after being away from England for almost three weeks. I was a little bummed that I would be leaving Europe and London tomorrow after four months. I went to bed with many great memories and no regrets. In my mind, I knew I would return to London one day.